Cleaning is no pleasant task. General home sanitation is a necessity which few love doing in their free time. This is why seeking professional help is the best idea. Call Cleaners to Hire and let us show you how efficiently the task can be done. 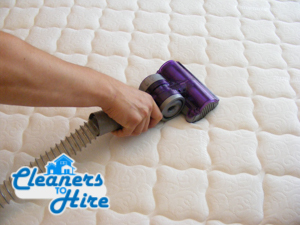 We specialise in a number of sanitation services but we really shine when it comes to taking care of your mattress and maintaining all sorts of furniture which have fabrics. If you opt to hire us often for the same service, you will be able to take advantage of reduced prices. We also have steam machines for more special cases related to mattresses. This is an exceptionally harmless way of doing sanitation as it is completely water based and uses electricity. We do not use harmful chemicals with our devices and it is still the most efficient procedure when deep cleaning is required. Vacuums and steamers are good of you need us to deal with upholstery and curtains as well. We will make sure no damage is done to your fabrics. We do have full insurance, however, which guarantees that you are covered in case anything fails to work as planned. It’s one of our many specialized services to keeping your upholstery sanitized. Sometimes stains need to be removed and we are the company to get when this is the case. It is better to be done earlier than later because you do not want these stains or spills to go stale. It will be harder to remove then. This is why we also conduct emergency cleanings. Convenience and availability are two important qualities that each professional sanitation company needs to have. This is exactly what our same day bookings implicates. If a spill occurs do not wait and call us. We being constantly available is aided by the fact that you can book us for every day of the week. Other jobs are better off executed if we know in advance. This will allow for better planning. We try to tailor our services according to the needs of our clients. Our teams are trained to perfection. We are very conscientious about the skills of our workers and this is why we try to develop every aspect of their arsenal. This includes communication abilities as well. Along with mattress and dry cleaning we have a lot more sanitation services both for your home and office. Get us for a one-off and we can even include junk removal in the deal, this is applicable anywhere in London.